Social Share Buttons With Counter on Blogger - This time i'm shareing social share count buttons? How to make a share with counter Because someone requests the tutor so I will share here. This share button will be useful if you want to know how many share your articles on social media like Twitter, Facebook, and Google Plus . For a while, it only counts the 3 social media. 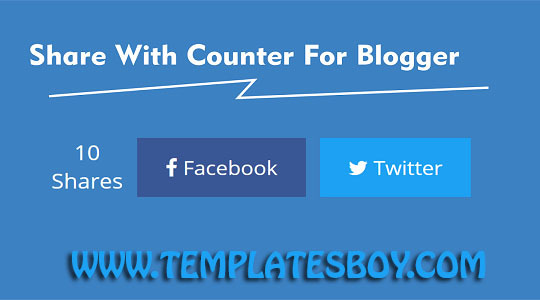 Share With Counter has been used a lot, especially on WordPress , and I am interested in making it to blogger. because it's really good :). Well for those who want to install it too, please refer to the tutorial below :). 3. Search for code ]]></b:skin>, use CTRL + F to make searching easier. 7. Finish, then buddy Save / Save and See the results.